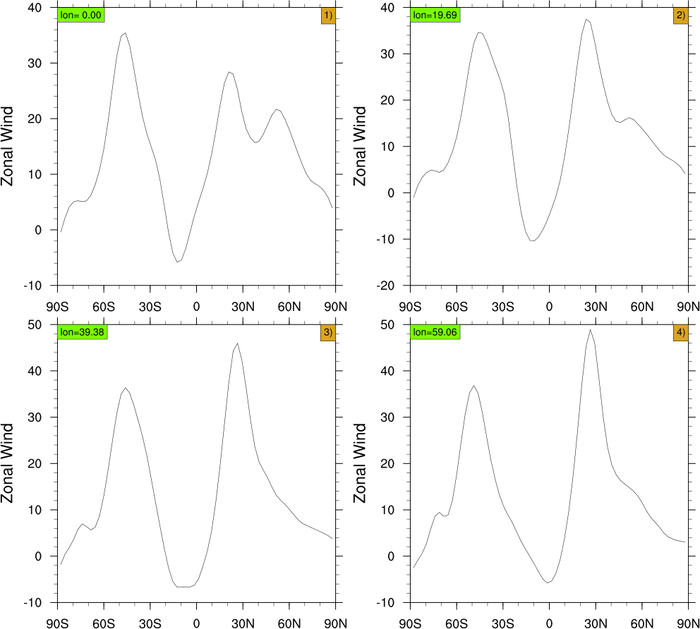 gsn_panel is a powerful procedure that allows you to "panel" multiple plots on the same page. There are many special gsnPanel resources that are specific to this procedure. Note: gsn_panel calls draw and frame automatically for the user. You do not need to call these after you call gsn_panel. A debug tip: setting the panel resource gsnPanelDebug to True causes a bunch of output to be echoed to the screen, telling you what values are used for the plot positions and sizes in gsn_panel. You can then use this information to adjust resources as necessary. 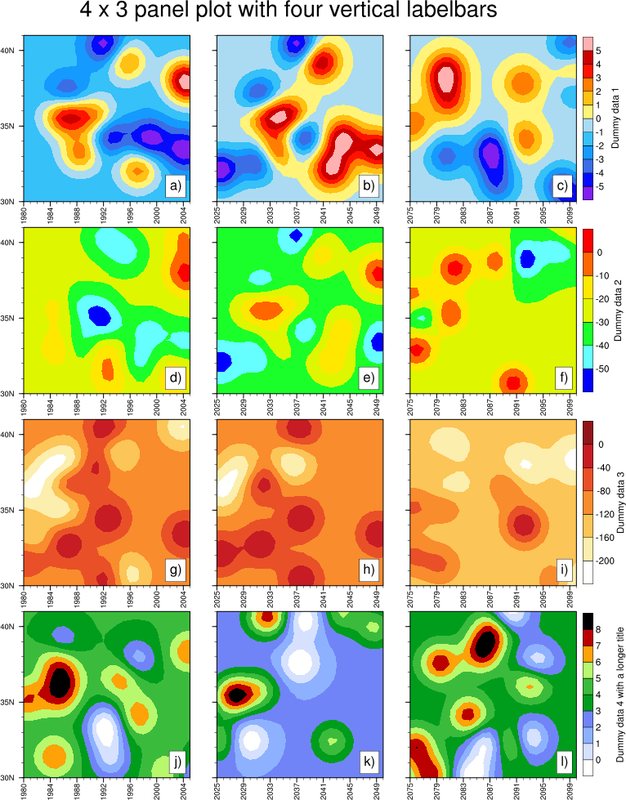 When using gsn_panel it is generally recommended that you not set gsnMaximize to True in the resource lists that control the look of the individual plots. When paneling, gsnMaximize should only be set in the panel resource list, as in Example 13 or Example 25.
panel_1.ncl: This is the simplest panel plot. Three plots are draw and then placed on the page. In most instances, the user will also want to add a common title or label bar. Subsequent examples demonstrate these features. 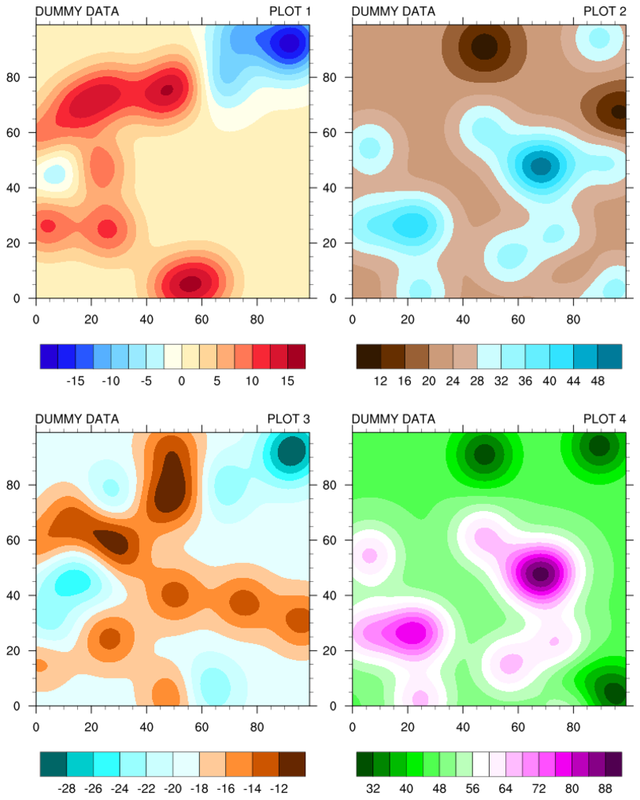 gsn_panel is the plot interface that creates panel plots. gsnDraw and gsnFrame should be set to false when drawing the individual plots so that they can be saved for the panel plot. You do not, however, need to call these afterwards. gsn_panel calls them for you. panel_2.ncl: Adds a common title to the plot. In NCL versions 6.4.0 and later, gsnPanelMainString is the resource that sets a main title for the paneled plots. In NCL versions 6.3.0 and earlier, txString is the resource for setting a main string. panel_3.ncl: Adds a common label bar to the plot. lbLabelBarOn = False, Turns off the individual label bars, while gsnPanelLabelBar = True, adds a common label bar at the bottom of the plot. lbLabelFontHeightF is used to decrease the labels sizes of the common labelbar. 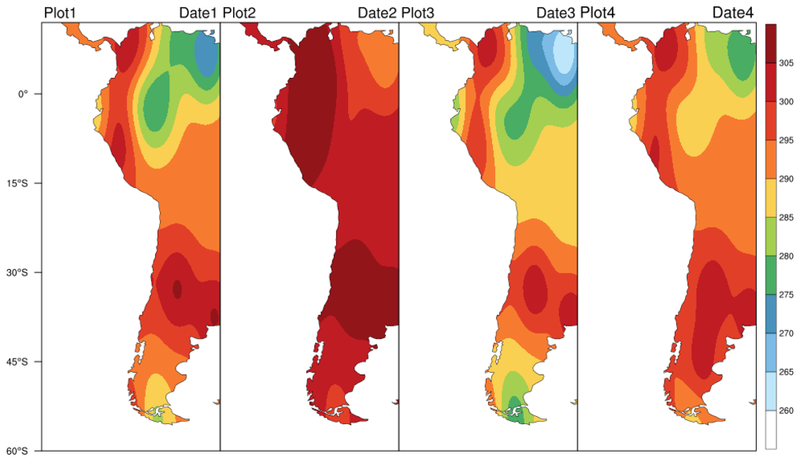 Remember to manually set the contour levels so that each plot has the same interval. The common label bar is draw from the first plot, and assumes all are the same. panel_4.ncl: Adds some space at the bottom of the plot for more text. 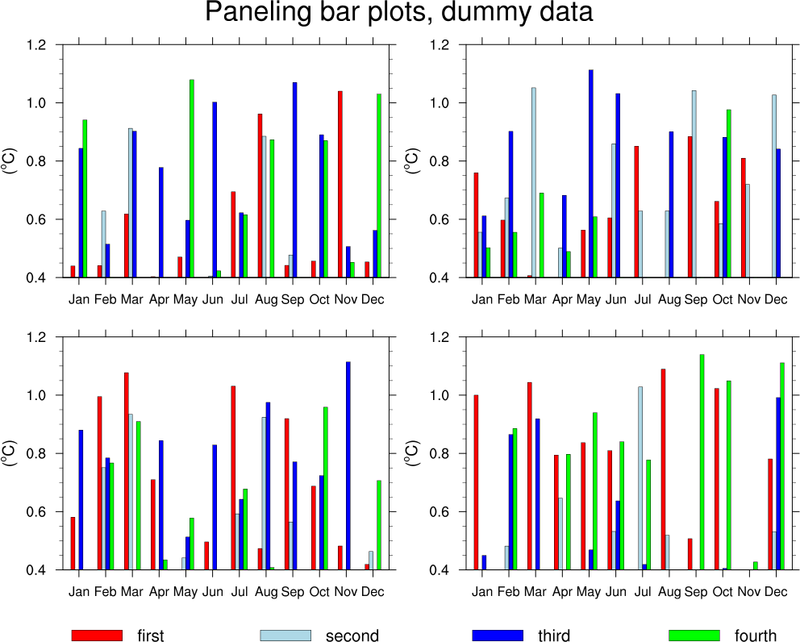 gsnPanelBottom = 0.05, Is the panel plot resource that adds space at the bottom of the plot. panel_5.ncl: Automatically adds text strings to the panel plot. These strings can be anything you want, but the text used here is most common. gsnPanelFigureStrings = (/"a)","b)"/), is the resource that will add a string to a corner in a panel plot. The default position is the bottom right-hand corner. In this example, we use amJust "TopLeft", to move them to the upper left-hand corner. Additionally, amOrthogonalPosF and amParallelPosF will how close the boxes are to the axis. Zero is the center of the line, and 0.5 is flush with the right and -0.5 is flush with the left. You can use gsnPanelFigureStringsPerimOn to turn off the box around the FigureString, and gsnPanelFigureStringsBackgroundFillColor to change the background color. panel_6.ncl: Demonstrates the addition of white space to a panel plot. The first figure contains no white space. You can see it is somewhat cramped. The second figure as 5% white space added in both x and y. It looks much nicer. gsnPanelXWhiteSpacePercent = 5, Adds the white space to the panel plot. panel_7.ncl: An example of a compressed panel plot. In this case we remove the longitude labels and tickmarks from the first two plots and keep only the one on the bottom. Since the plot template judges the spacing of the panel plot from the first plot, we need to add just a bit of space at the bottom like we did in example 4 in order to see the long labels on the bottom plot. panel_8.ncl: Similar to example 7, except that we really start turning the tickmarks and their associated labels on and off. 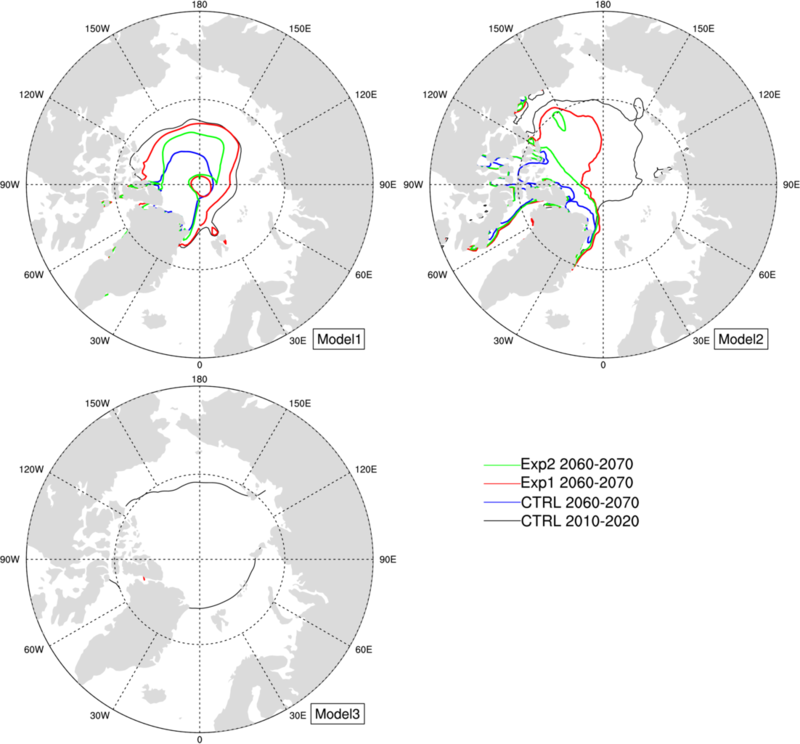 panel_9.ncl: Create a panel plot using viewport specifications. This is required if the plots are of different shapes. panel_10.ncl / panel_attach_10.ncl: There may be time when it is necessary to panel plots next to each other that have different sizes. If these plots can be attached, then the resulting new plot can be paneled. 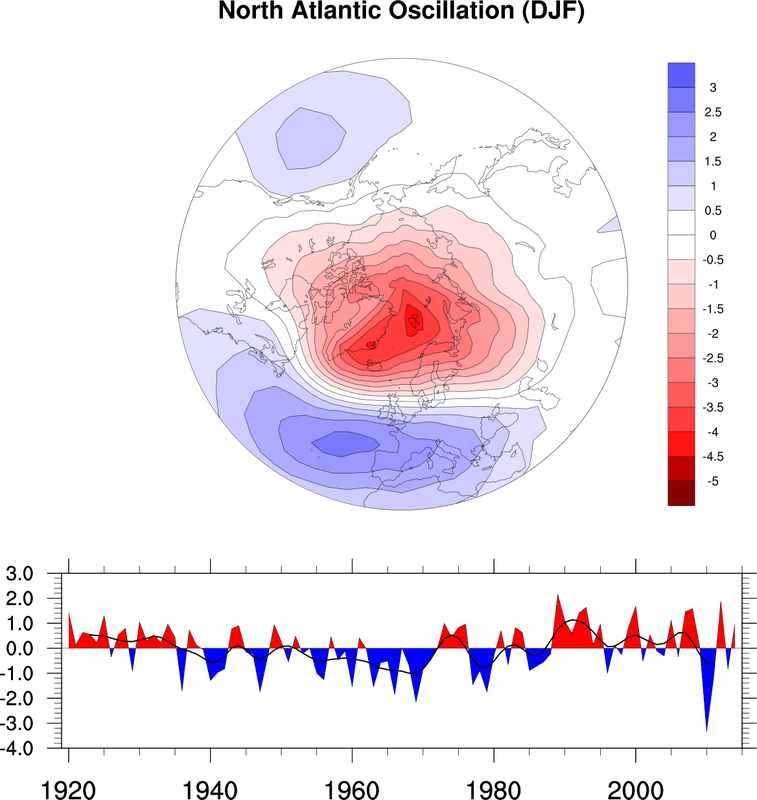 In this example, we attach a zonal average plot to a Hovmueller diagram. 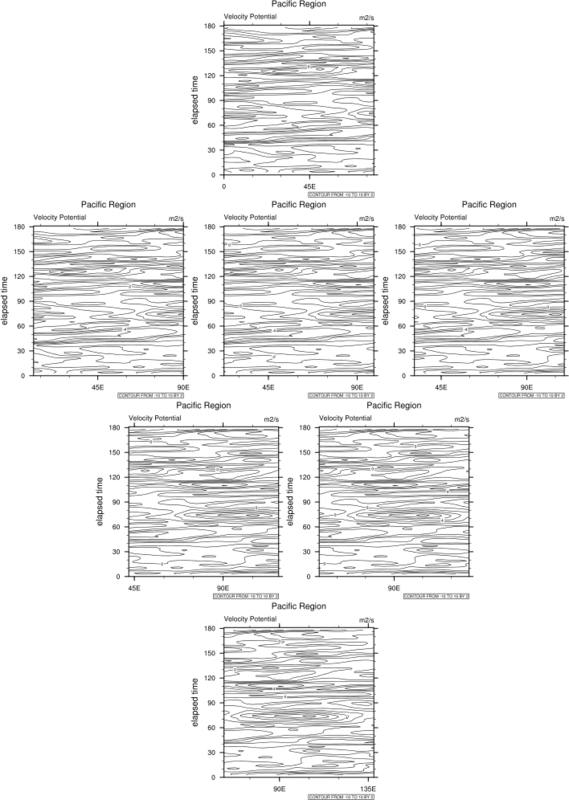 The result is one plot that could then be paneled (see panel_attach_10.ncl). This second script uses the nice "time_axis_labels" procedure to generate nice time labels on the Y axis. gsn_attach_plots is the plot interface that will attach the a group plots along the y-axis (default). If you set gsnAttachPlotsXAxis to True, then the plot will be attached along the x-axis. Draw each plot separately, but then fine tune once you see them attached, and "scrunched". In our example, we removed the minor tickmarks and only plotted every other x-axis label. The function gsn_attach_plots returns a special id number (an integer), and not a plot (a graphical object). plot1 would now only contain the original Hovmueller diagram. panel_11.ncl: As of NCL version 4.2.0.a012, gsn_panel has the option of specifying how many plots should be placed on each row. To do this, set gsnPanelRowSpec = True. The default layout is for the plots to be centered. You can change this by setting gsnPanelCenter = False. panel_12.ncl: Demonstrates putting two separate panel plots on one page, so that each can have its own unique label bar. The important thing to remember here, is to create two separate plot arrays to hold the individual plots for both panels. This is required b/c the label bar is taken from the last plot drawn. 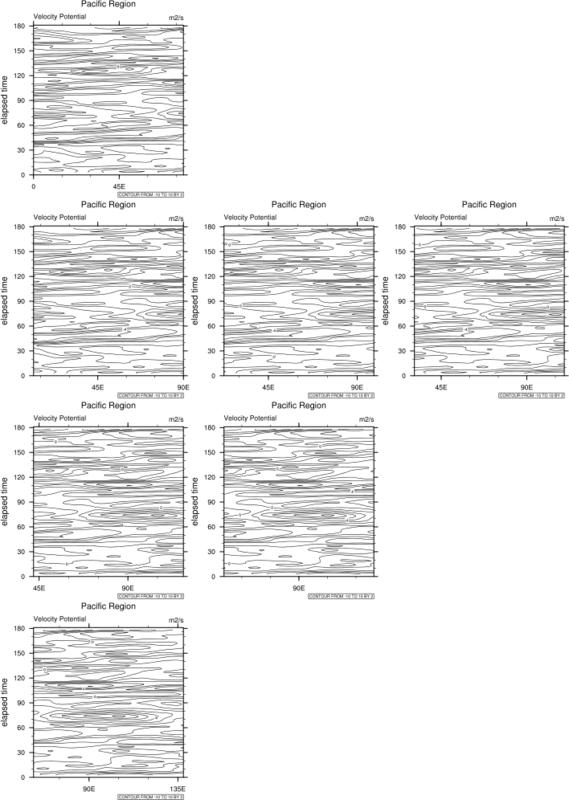 gsnPanelRight = 0.5, tells the plot to only draw on the left 50% of the page, while gsnPanelLeft = 0.5, tells the plot to only draw on the right 50% of the page. panel_13.ncl: Demonstrates paneling plots created with overlay. panel_14.ncl: Demonstrates combining a two-panel panel plot with two manually placed line plots. 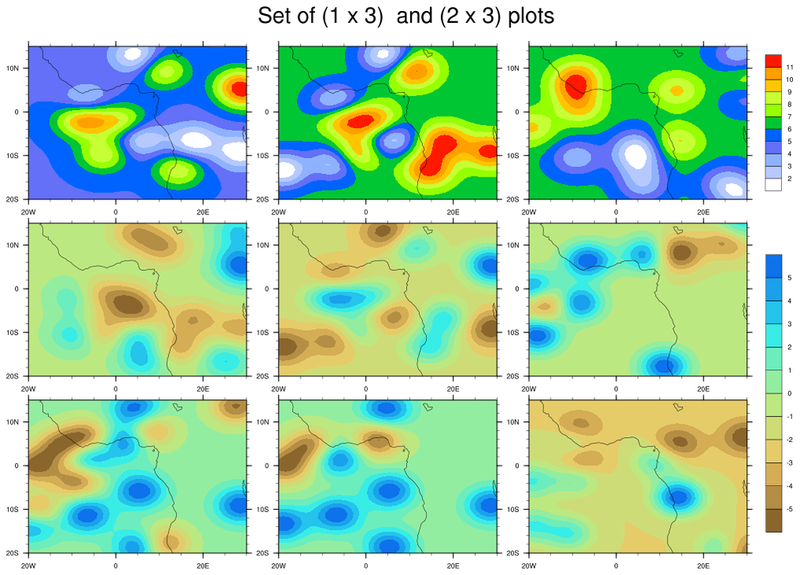 This is required b/c gsn_panel assumes all the plots are the same size, and these plots are different enough to prevent their lining up axis to axis. Thanks to Keith Lindsay for this example. The trick here is to divide the page into two sections. The lower section will just be for the contoured panel plot and its common label bar. We can tell gsn_panel to only draw its result in the lower half of the page by setting gsnPanelTop to 0.5. 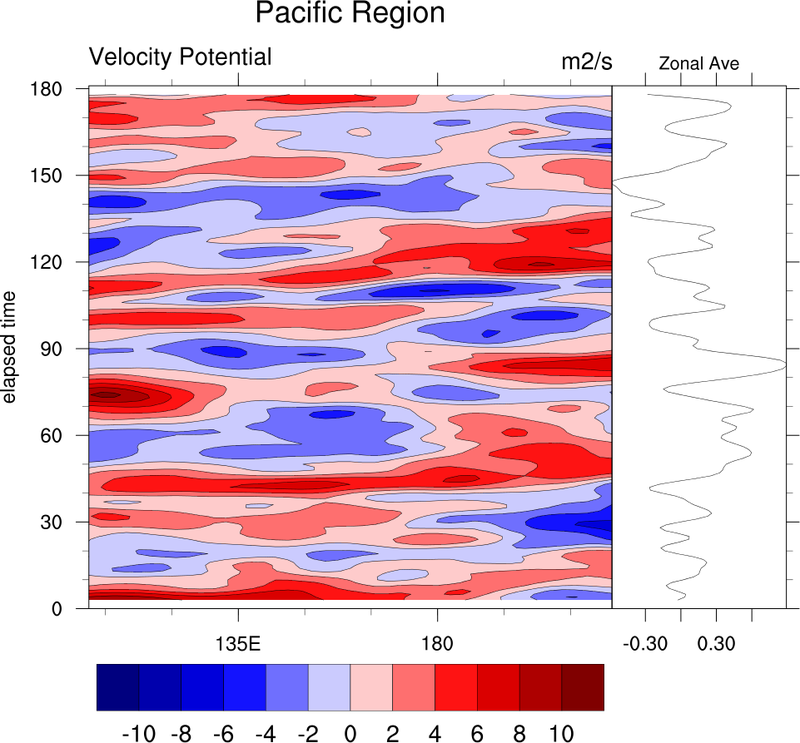 Next, we make sure the width of the xy plots is the same as the contour plots by setting vpWidthF to its appropriate value. 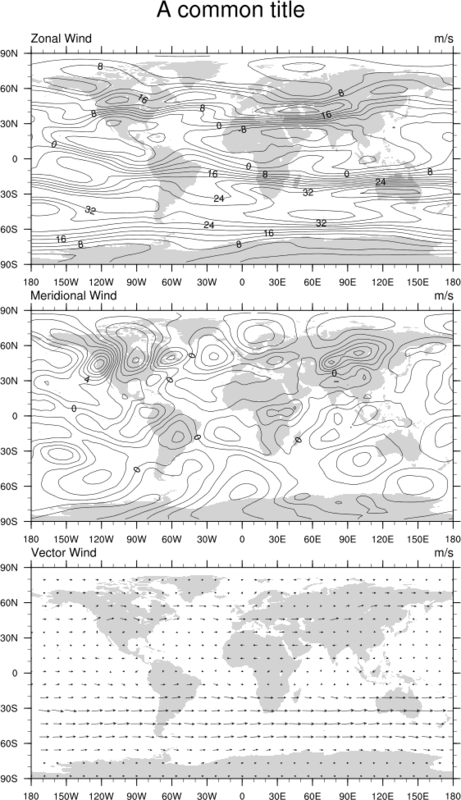 Finally, we exactly position each of the two xy plots in ndc space so that their axis line up with the contour plots. This is done by setting vpXF to its appropriate value. pmLabelBarWidthF is used to increase the width of the labelbar. 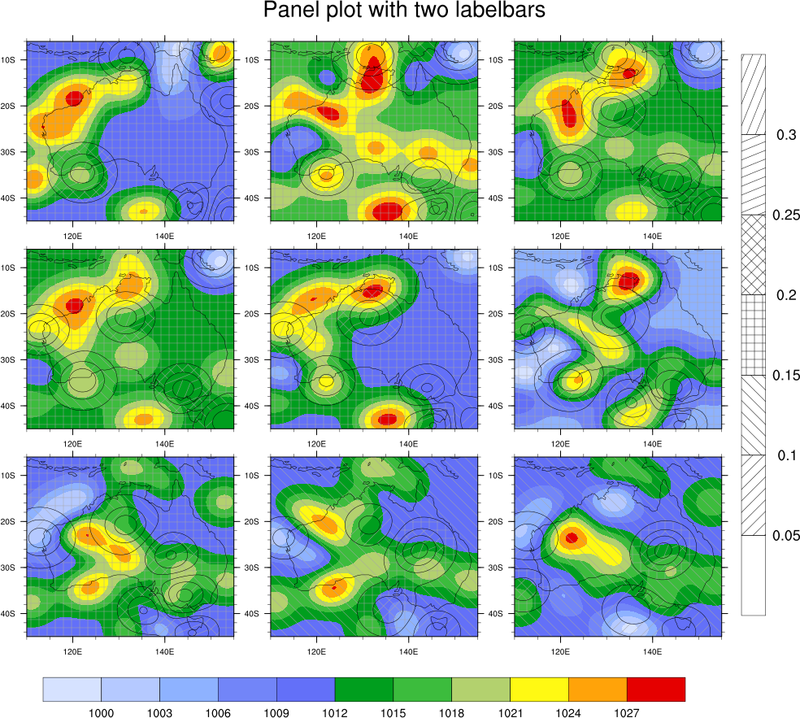 panel_15.ncl: Demonstrates paneling two sets of contour plots on the same page, each with its own labelbar. You must download panel_two_sets.ncl for this script to run. The panel_two_sets procedure is similar to gsn_panel, except you give it two sets of plots to panel, each with their own dimensions for paneling and their own panel resources. There's a third resource list that is solely for setting the gsnPanelTop / gsnPanelBottom / gsnPanelLeft / gsnPanelRight resources if needed. The two sets of plots can be paneled side-by-side in a "horizontal" configuration, with the labelbars appearing at the bottom, or in a top-and-bottom "vertical" configuration, with the labelbars appearing at the right. This function will figure out the orientation to use based on two dimension arguments. For example, if you have 6 plots that you want to panel in a 3 x 4 configuration and 3 plots that you want to panel in a 2 x 4 configuration, then all the plots will be drawn in a single 5 x 4 configuration with the 3 x 4 plots appearing on top, the the 2 x 4 plots on the bottom. They will each have a horizontal labelbar appearing at the bottom. If you have a set of 2 x 3 plots and a set of 2 x 2 plots, then the plots will be drawn in a 2 x 5 configuration, with the 2 x 3 plots on the left, and the 2 x 2 plots on the right, and vertical labelbars appearing at the right. 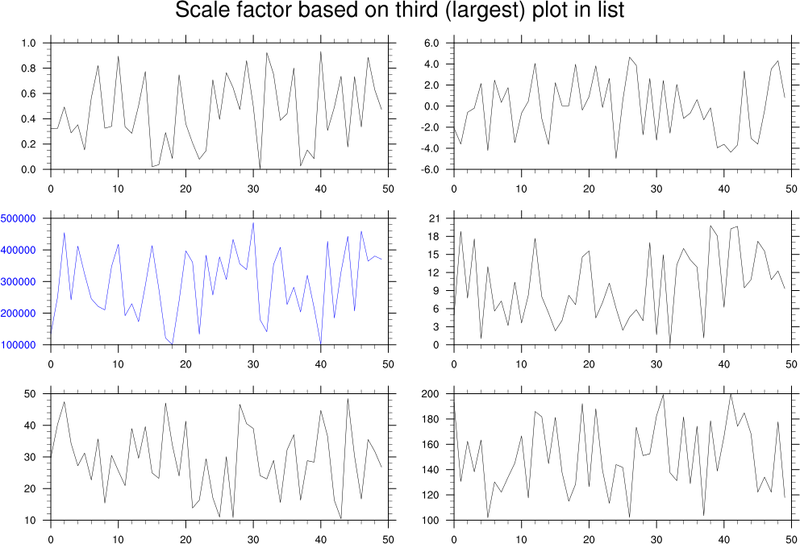 For a horizontal configuration, the two sets of plots must each be paneled using the same number of rows. For a vertical configuration, the two plots must have must be paneled using the same number of columns. 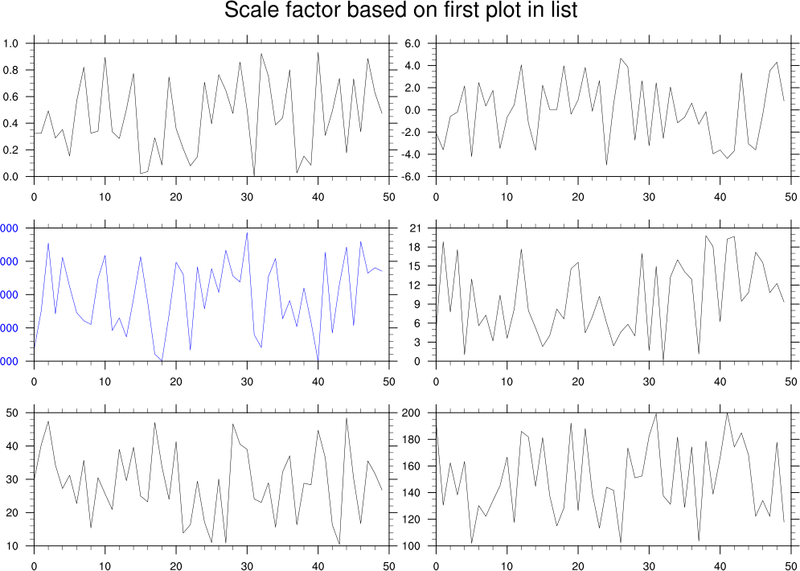 panel_15_old.ncl: Demonstrates using gsn_panel twice in order to get groups of plots with different label bars. Note: see panel_15.ncl above for a function that makes it easier to panel two sets of contour plots, each with their own labelbar. This example is an older version that is being kept for historical purposes. The trick here is the setting of gsnPanelBottom and gsnPanelTop for the two respective panel plots. 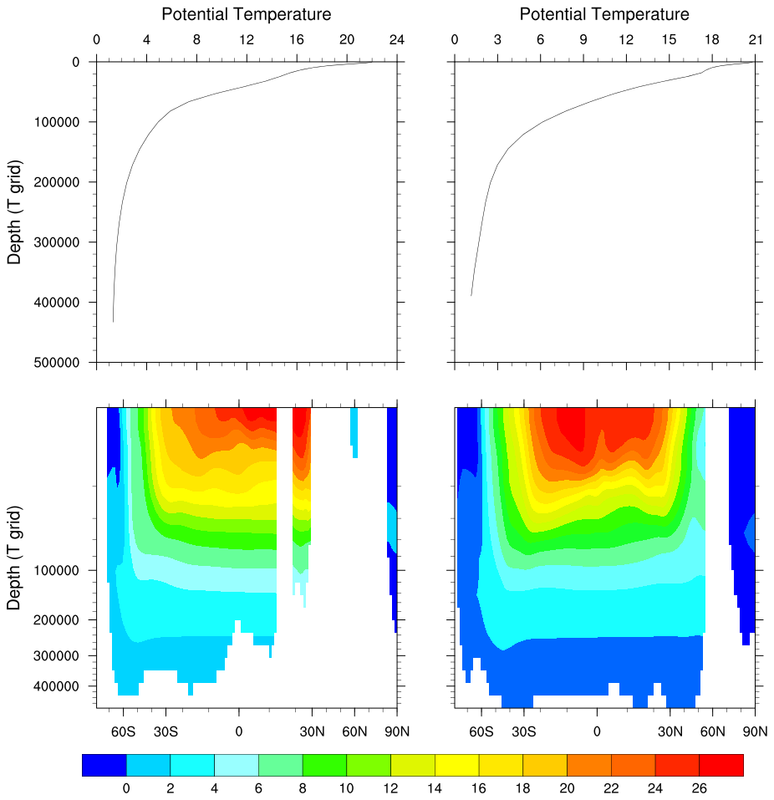 For the first panel, we move the bottom up to 0.4, which leaves 0.6 for the two panel plot. This means that each plot will be 0.3 in size. For the third, single panel plot, we draw only up to where the upper plot ended at 0.4. One more step is required, and that is to move the bottom of the bottom panel up to 0.1 so that the total draw area for this plot equals 0.3, just like we have for the upper plots. If you do not set gsnPanelBottom in this case, then the bottom plot has 0.4 space and will not be the same size as the upper two plots. panel_16.ncl: Demonstrates using gsnPanelBottom and gsnPanelTop to "squeeze" the panel plots to approximately a column width for use in a publication. By setting gsnPanelTop = .9 and gsnPanelBottom = .2, the panel plots are drawn on .7 of the page instead of the entire page. This is a very easy way to shrink panel plots to a desired size. panel_17.ncl: Demonstrates how to panel four plots that have two separate labelbars and a main title. 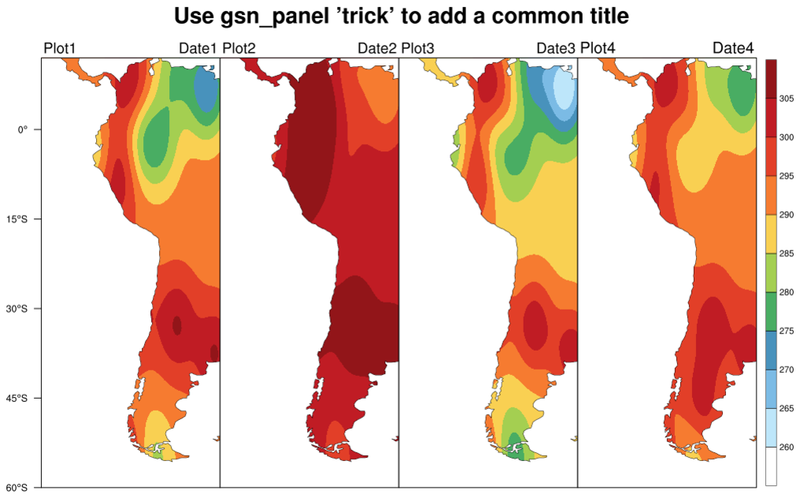 The gsnPanelTop and gsnPanelBottom resources are used to make sure the two sets of plots are drawn in an area of the same size so that the plots are the same size, and then a small area is reserved for drawing the main title using gsn_text_ndc. The generate_2d_array function is used to generate dummy data for this example. panel_trilbar_17.ncl: This example is similar to panel_17.ncl, except it shows how to get triangle ends on the labelbar by setting the lbBoxEndCapStyle resource to one of three values: "TriangleLowEnd", "TriangleHighEnd", "TriangleBothEnds". The default for this resource is "RectangleEnds". panel_18.ncl: Similar to example 15, this example demonstrates that the label bar need not explicitly have color in the middle. 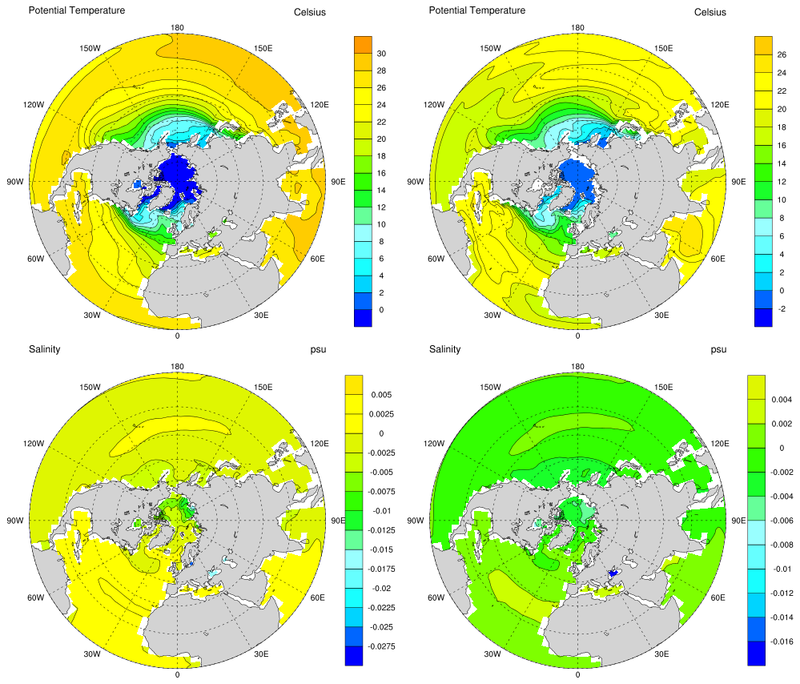 This is shown in the bottom panel, as cnFillColors is manually being set, and the background color (0, = white for BlAqGrYeOrRe colormap) is used to fill in all areas between -1 and 1. You must download panel_two_sets.ncl for this script to run. 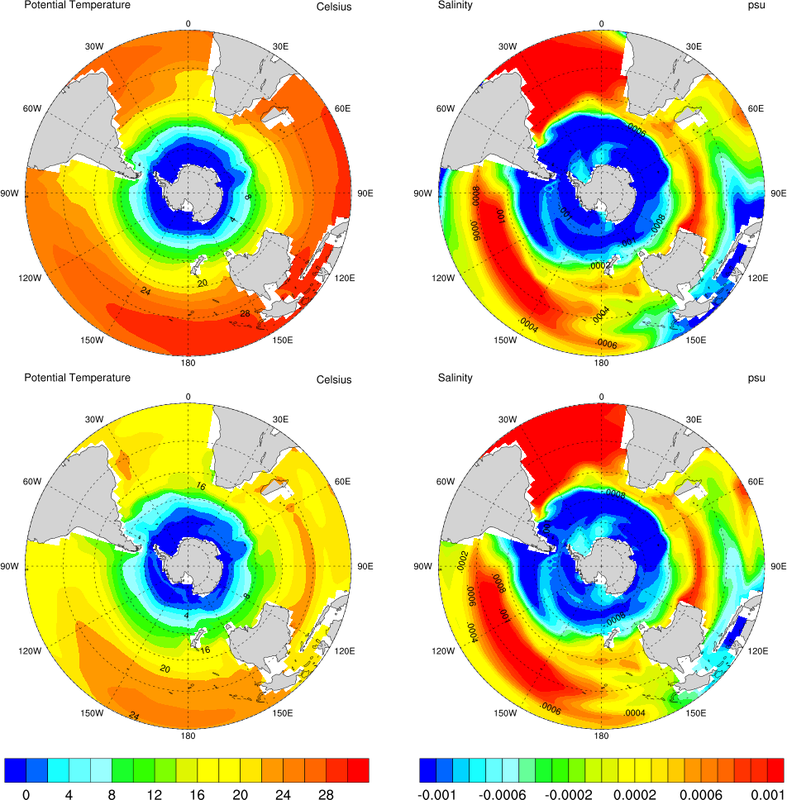 See example panel_33.ncl for another version of this plot, but with more plots, and using newer NCL features to define the color map for each set of contours. panel_trilbar_18.ncl: This example is similar to panel_18.ncl, except it shows how to get triangle ends on the labelbar by setting lbBoxEndCapStyle to "TriangleBothEnds". 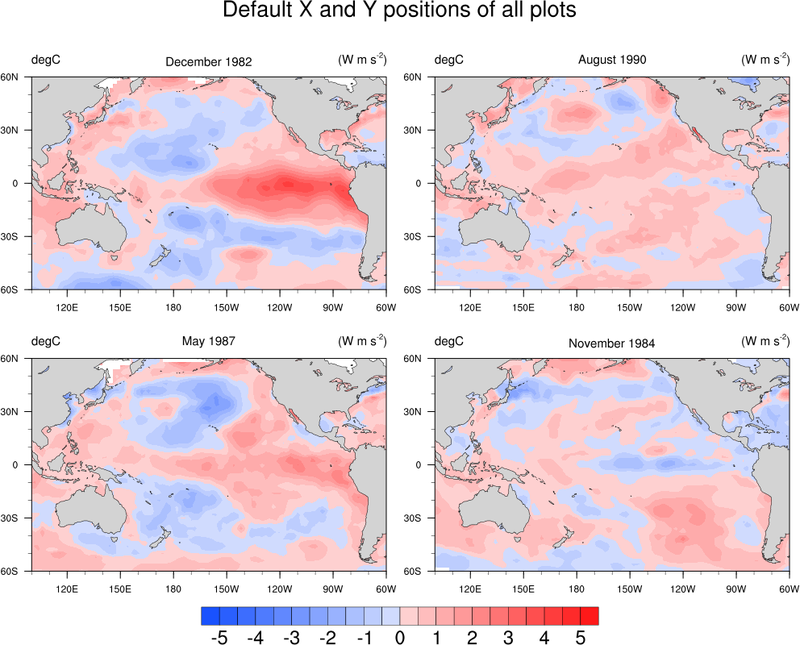 panel_19.ncl: This example shows how to use the gsnPanelXF and gsnPanelYF resources to adjust the X and/or Y NDC positions of the upper left corners of plots in a panel. The first frame shows the paneled plots without adjustments, and the remaining two have both X and Y adjustments. These resources must be arrays of the same size as the number of plots you have. Any individual plots that you don't want to adjust, you can set a negative value and the default value will be used. You can optionally set gsnPanelDebug to True to have some debug information about the default X and Y positions being used, so you know approximately how much to tweak the values. 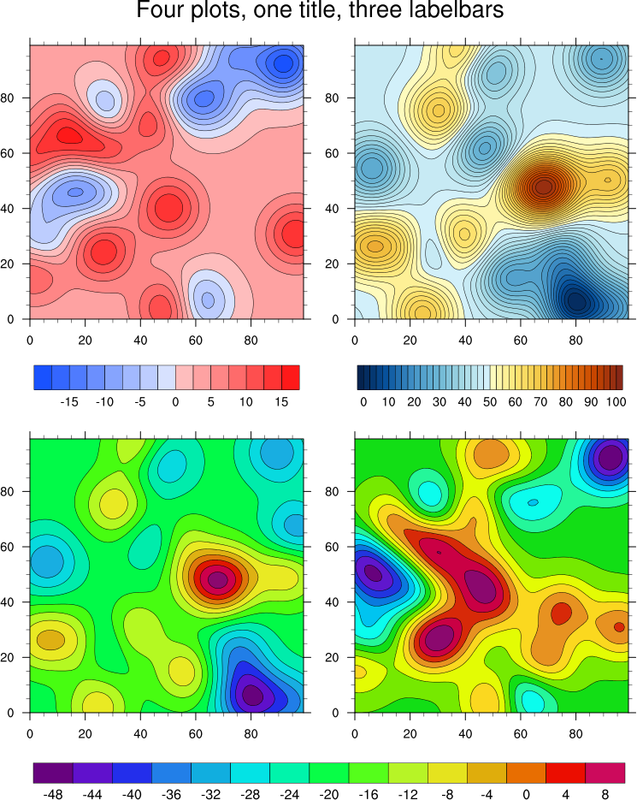 These resources will be added in version 4.3.0.
panel_20.ncl: This example shows how to use viewport resources vpXF, vpYF, vpWidthF, and vpHeightF, to panel different-sized plots. If you try to use gsn_panel, you will get unexpected results. In order to maximize these four plots in the frame, the procedure maximize_output is used. panel_21.ncl: This example shows how to add a common title, and common x-axis and y-axis labels to a panel plot using gsn_text_ndc and the gsnPanelLeft, gsnPanelRight resources. 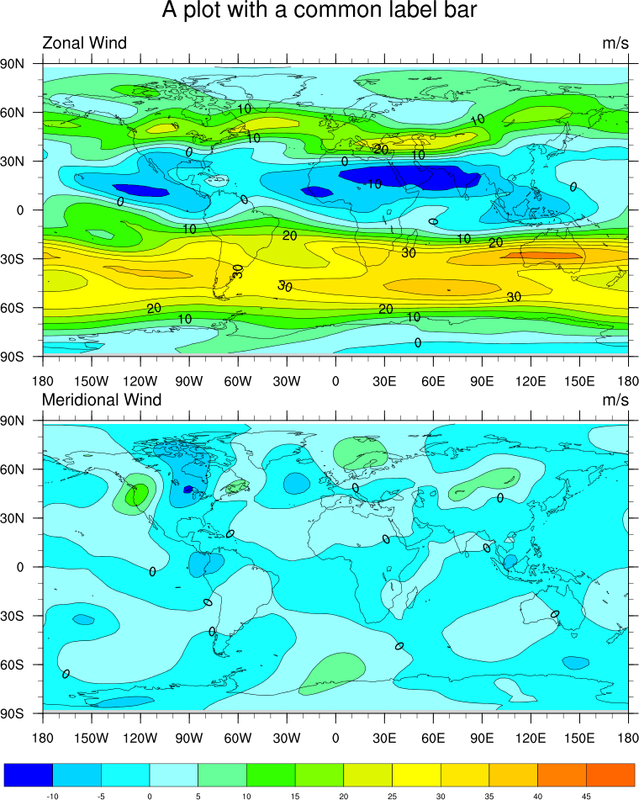 This script was written by Jonathan Vigh, a PhD candidate student in the Atmospheric Sciences department at Colorado State University. panel_22.ncl: This example shows how to add individual common titles to a panel plot that actually contains two panelled plots (each 2 rows x 1 column). In NCL versions 6.4.0 and later, use gsnPanelMainString to set a main title for the paneled plots, and gsnPanelMainPosXF to position it. You need to use a value between 0 and 1, because otherwise both titles will be exactly centered on the page (=0.5). In NCL versions 6.3.0, use txString and txPosXF resource control the main string. panel_23.ncl: This example shows how to draw a panel of 4 plots with the plots attached along the X and Y axes. A common title and labelbar is added. gsn_panel is NOT being used here. 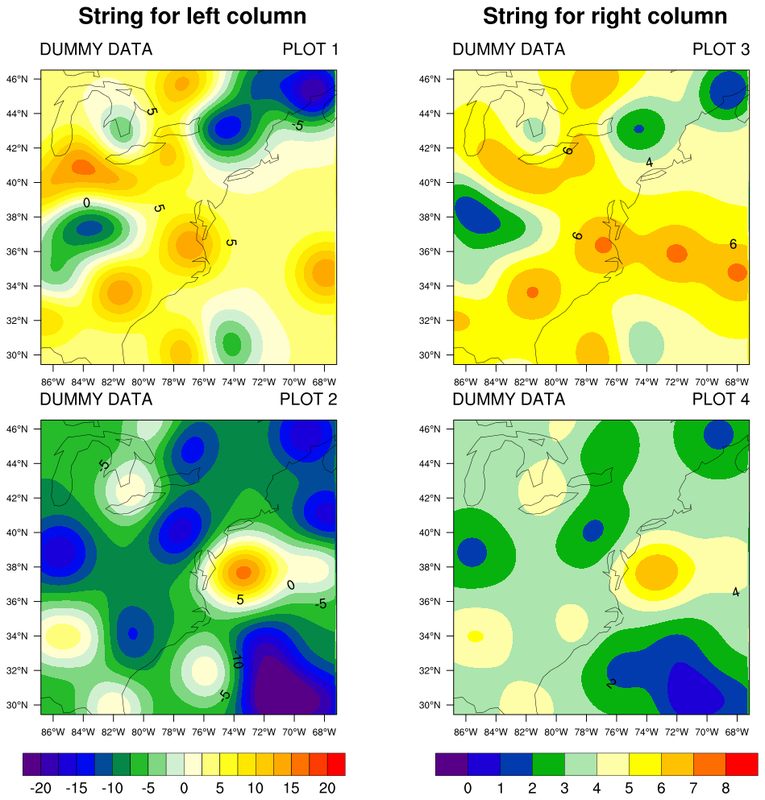 Instead, the resources vpXF, vpYF, vpWidthF, and vpHeightF are set to control the size and location of each plot, and tickmark resources are set to turn off labels and tickmarks on the various axes. The second frame is generated by calling maximize_output, which maximizes all objects in a frame. panel_24.ncl: This example shows how to draw a panel of 3 x 2 plots where each plot is a slightly different size due to Y axis labels that are different lengths. The first frame shows what the paneled plots looks like, without any special options set. Note the plot with the blue Y axis labels, and how they run off the screen. 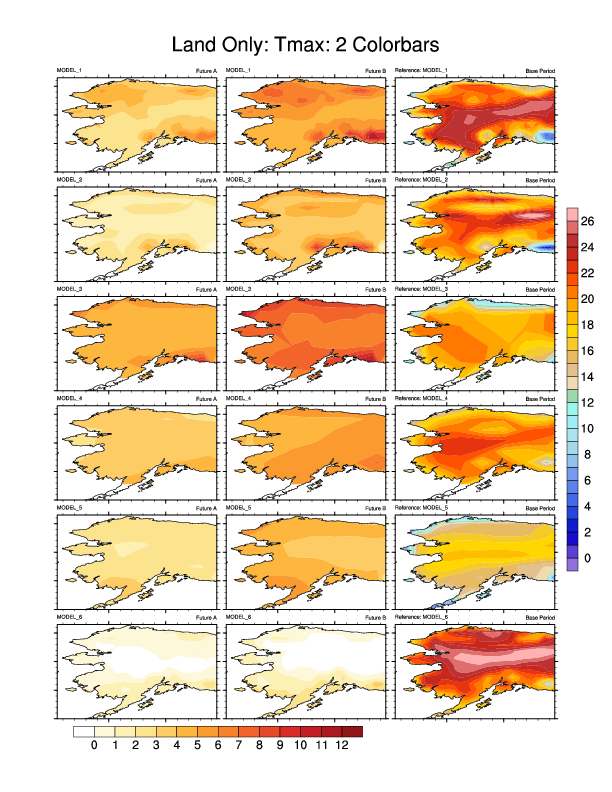 By setting gsnPanelScalePlotIndex to 2 (the third plot with the labels, counting starts at 0), you can tell gsn_panel which plot to base the scale factor on when resizing all the plots (the default is the first valid plot). panel_25.ncl: This example, which was contributed by Gary Bates of NOAA, shows how to draw a three plots in a row, where each plot is the same height, but a different width. A common labelbar and title is added. If you draw the default panel plot, the plots run into each other. To fix this, Gary set the resources gsnPanelXWhiteSpacePercent and gsnPanelYWhiteSpacePercent to 2.0 to add some white space between each plot. 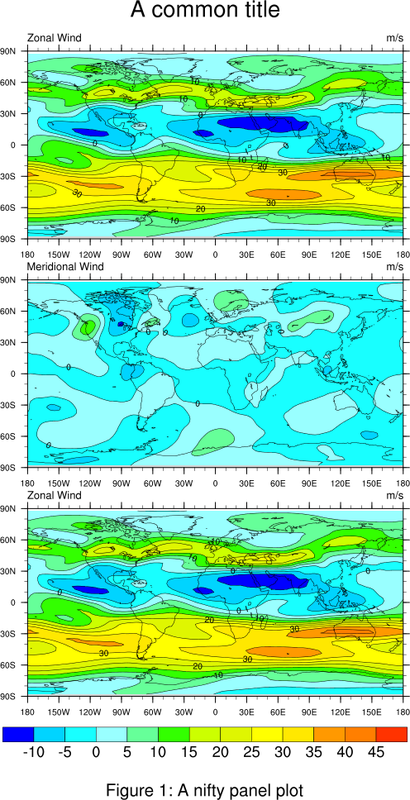 With plots like this, you may find it easier to position the plots yourself using the vpXF, vpYF, vpWidthF, and vpHeightF resources. However, you will then need to create the title and common labelbar yourself. bar_11.ncl: This script shows how to panel multiple bar charts and add a custom legend (using labelbars). This example uses the overlay procedure to overlay the individual bar plots. 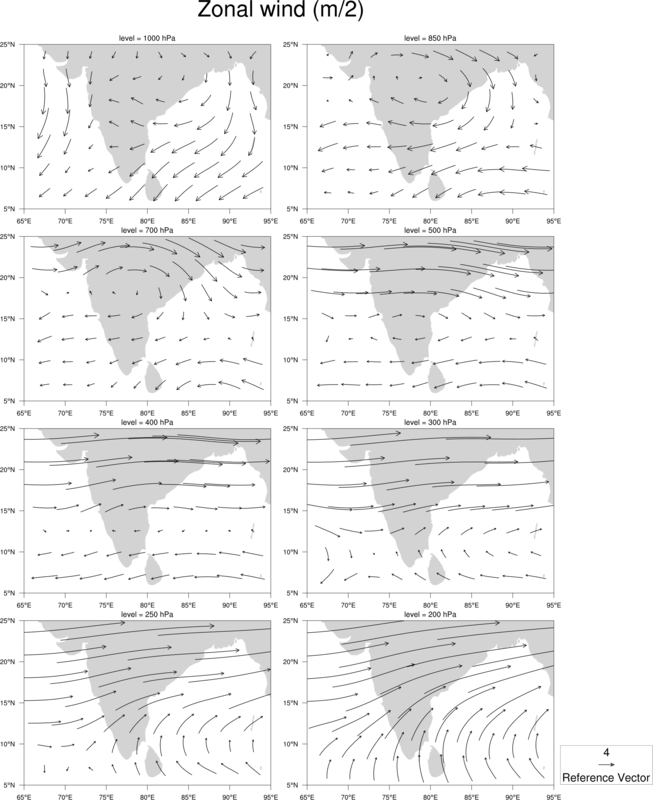 Finally, it uses gsn_panel to panel the four sets of plots. See the bar chart page for more examples of bar plots. 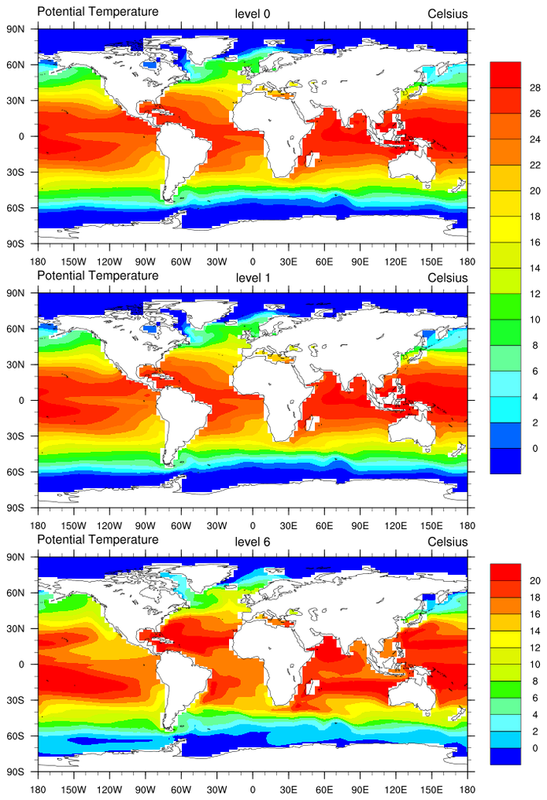 panel_26.ncl: This example shows how to draw multiple sets of paneled plots on one page, each with their own colormap. An unadvertised function is used, "gsn_panel_return", which returns the objects created by gsn_panel. This allows us to get the size of the paneled plots so we can draw the remaining ones right next to the previous ones. 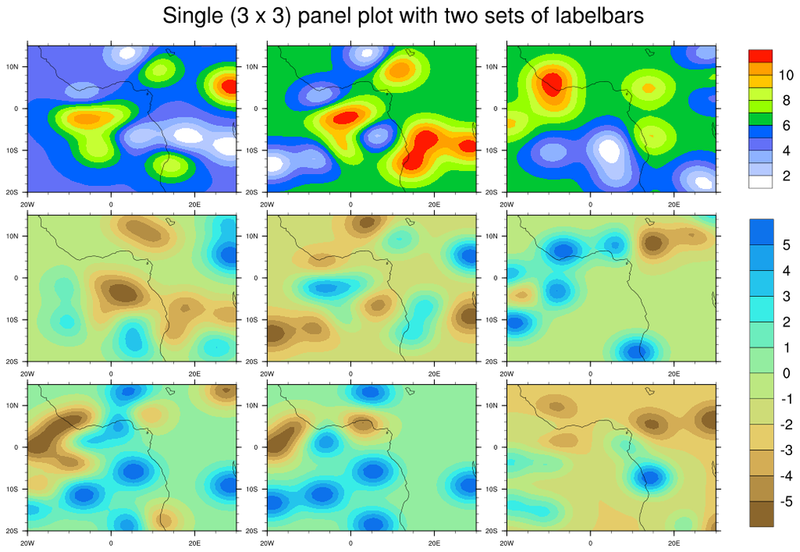 panel_27.ncl: This example shows how to draw a vertical shaded labelbar and a horizontal color labelbar on a 3 x 3 panel plot. 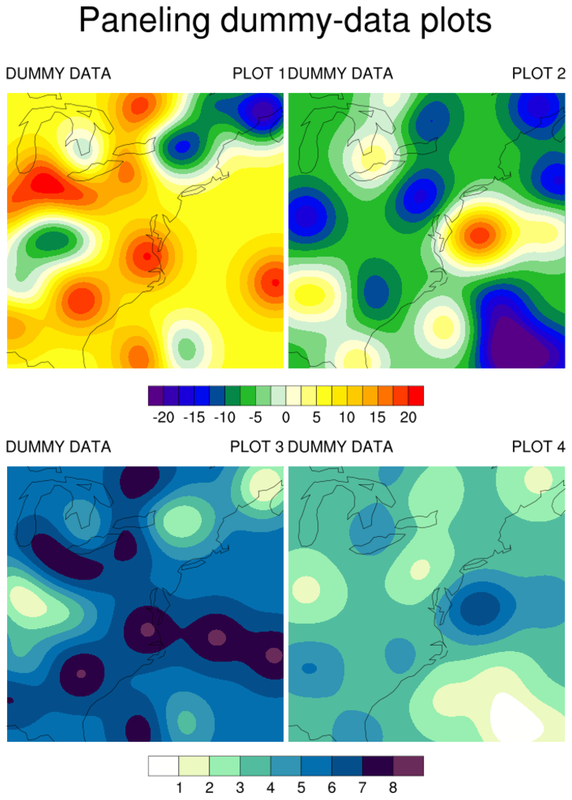 The plots were created using dummy data, and have shaded contours overlaid on filled contours overlaid on a map. The horizontal labelbar is added via the usual gsnPanelLabelBar resource, and the vertical labelbar is added using gsn_create_labelbar. This is not the cleanest solution, because creating a labelbar yourself can require setting quite a few resources. See the "labelbar" function in this script. panel_28.ncl: This example shows how to panel lots of plots (10x6) with slightly different sizes. The special panel resource gsnPanelScalePlotIndex was set to plot #7, to base the scaling on one of the smaller plots in the middle. This caused the plots to be too close together, so gsnPanelXWhiteSpacePercent gsnPanelYWhiteSpacePercent were set to values slightly higher than 1.0 (1%). Finally, in order to keep the left and right labels from running off the page, gsnPanelLeft and gsnPanelRight were set to 0.1 and 0.9 to give a little bit of a margin. panel_29.ncl: This shows how to draw two separate labelbars for variables with different spans. 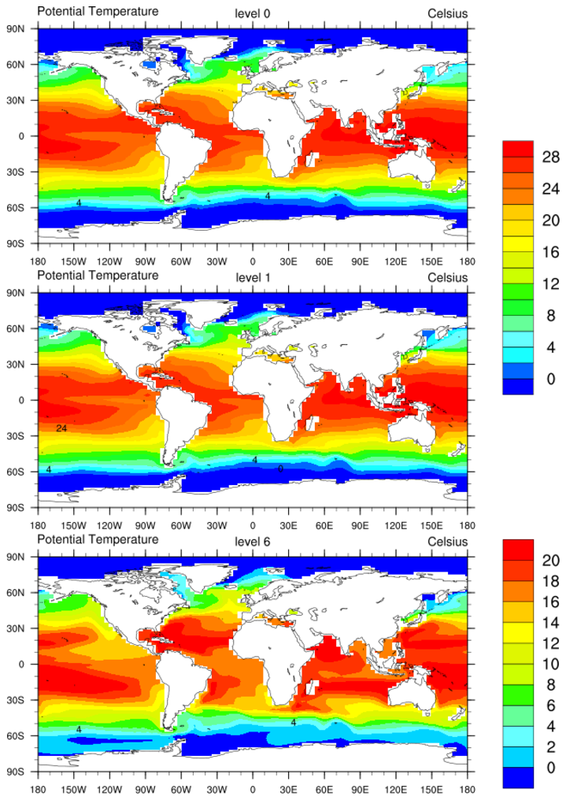 The leftmost two columns are future scenarios. The right column contains different model reference periods. NCL's masking is used to plot only the land area. 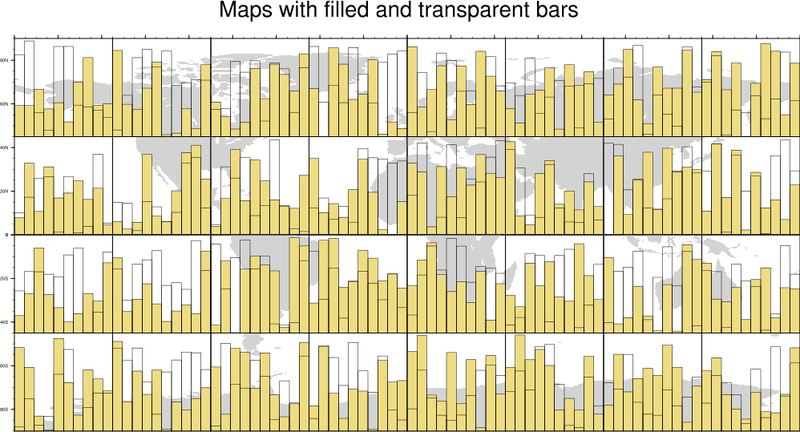 panel_30.ncl: This example shows how to divide a global map into a 4 x 8 array of individual maps with overlaid bar charts. Panel and tickmark resources are set so that the paneled plots have no white space between them. The bar charts are overlaid on the maps by setting the tfDoNDCOverlay resource to False and calling overlay to do the overlays. 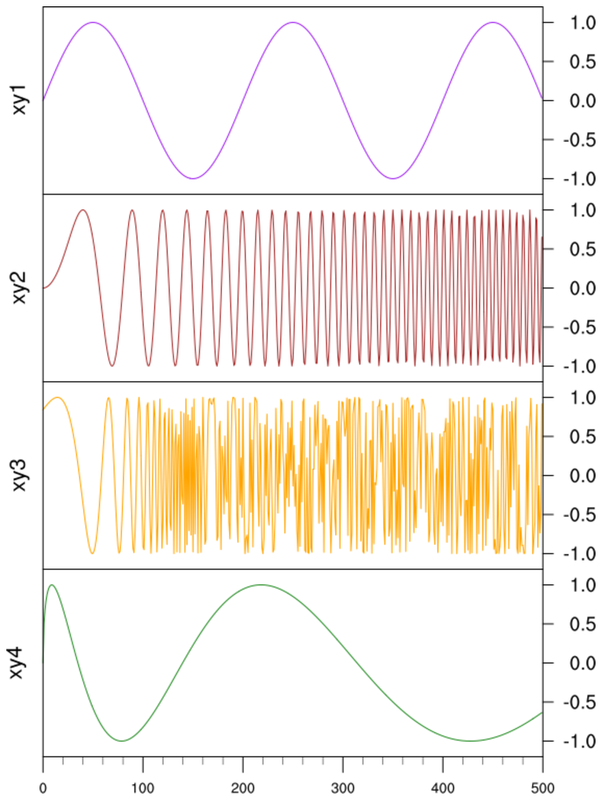 panel_31.ncl: This example shows how to panel vector plots with only one vector reference annotation box. If TOPO_MAP is set to True in the script, then it will overlay the vectors on a topographic map read from a JPEG image. 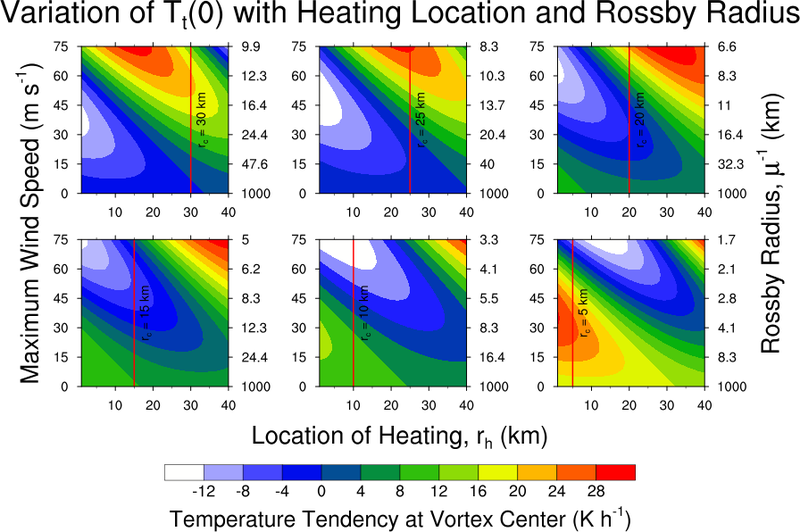 The vector reference annotation box is turned off for all plots except the lower rightmost one by setting res@vcRefAnnoOn = False for all but that one plot. The box is moved to the outside right of that plot by setting res@vcRefAnnoParallelPosF. 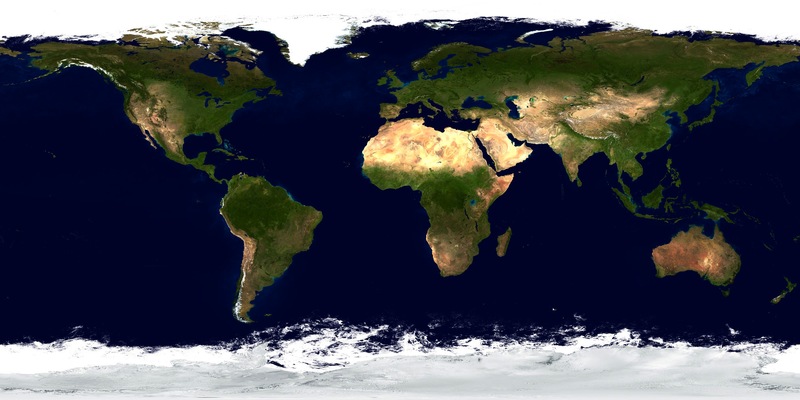 The topographic map is created by reading in a JPEG image. See example newcolor_11.ncl on the RGBA page. This image can be slow to create, so set TOPO_MAP to False in the script if you just want to generate a generic NCL map object (this is the second thumbnail image above). 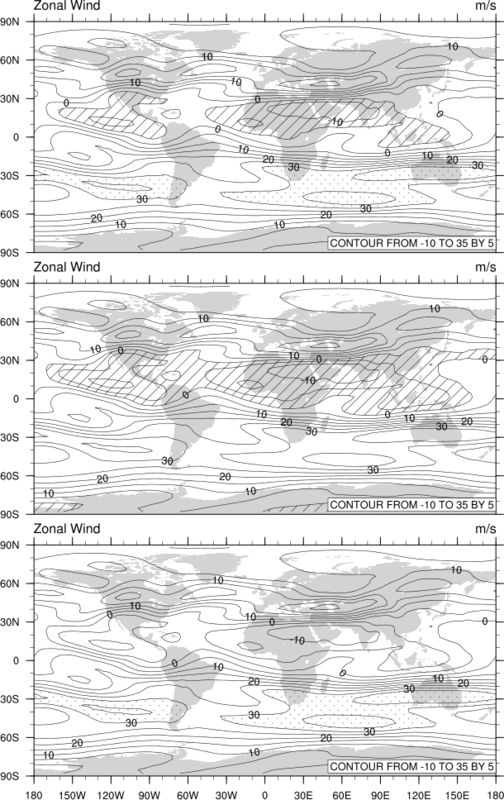 panel_32.ncl: This example shows how to panel three spaghetti contour plots that are overlaid on the northern hemisphere. The plots are left-justfied and the extra space is used for a custom legend, which is drawn with a call to gsn_legend_ndc. This example was contributed by Mira Berdahl of the Dept. of Environmental Studies, Rutgers University. panel_33.ncl: This example is similar to example 18, except it creates two sets of difference plots. It also demonstrates how you can use cnFillPalette to assign a color palette to a group of contour plots. panel_5x2_33.ncl: This example is similar to panel_33.ncl above, except there are three rows of regular plots and two rows of difference plots. This script uses the "panel_two_sets" function in panel_two_sets.ncl to make it easier to panel two sets of plots in various configurations. 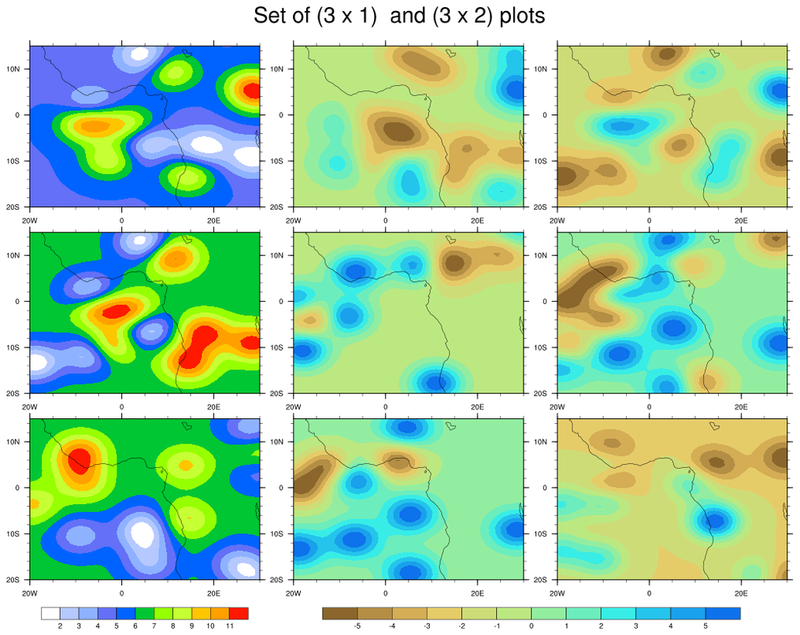 xy_23.ncl: Shows how to use gsn_attach_plots and the resource gsnAttachPlotsXAxis to attach multiple XY plots along the bottom X axes, and how resizing the base plot will automatically cause all plots to be resized. Several "tmYR" tickmark resources are set to control the ticks and the labels on the right Y axis. The default is to put tickmarks and labels only on the left axis. To put them on the right only, you need to set (for one) tmYUseLeft to False. The resource tmYRLabelDeltaF is set to 2.0 to move the labels further away from the right tickmarks, and tmYRLabelJust is set to "CenterRight" to right-justify the labels. 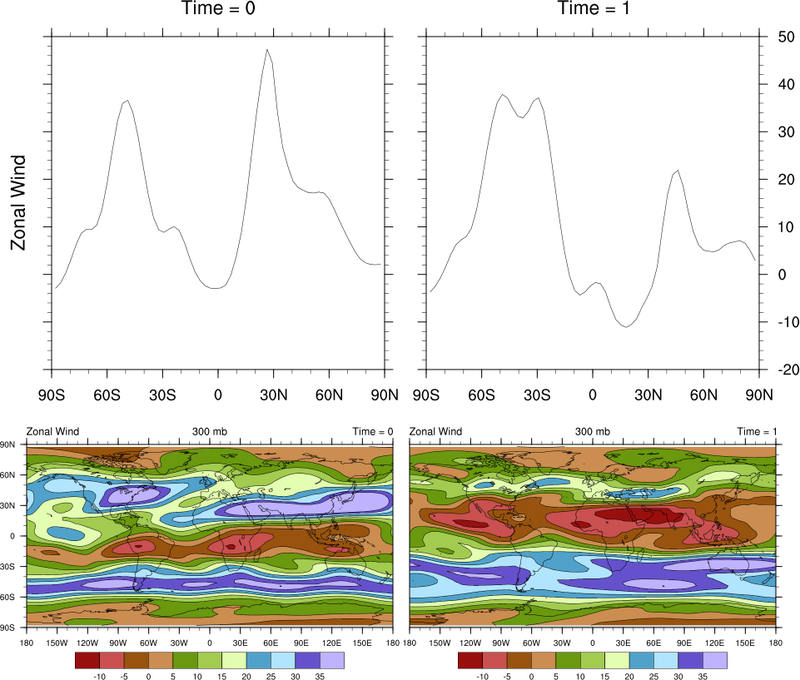 panel_34.ncl: This example shows how to draw two sets of paneled contour plots, using two different configurations: one with the paneled plots side-by-side with vertical labelbars, and one with the paneled plots top-to-bottom with horizontal labelbars. 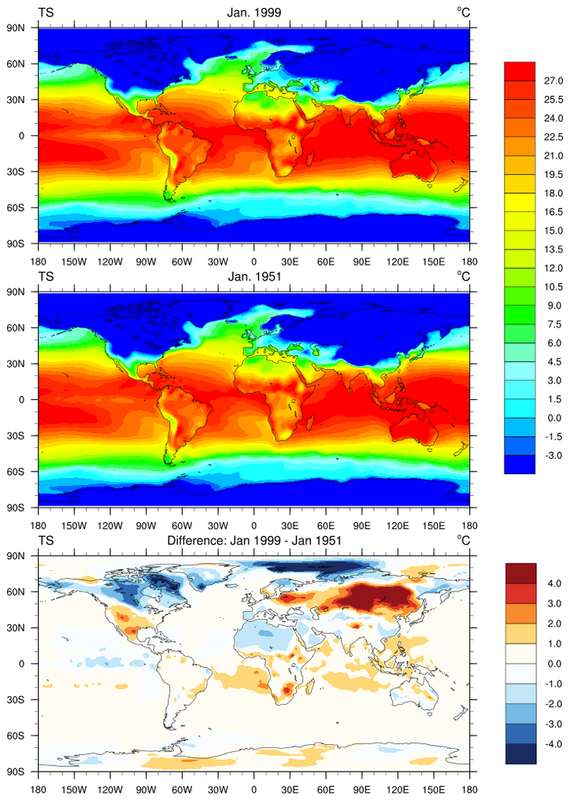 panel_old_34.ncl: This example shows how to draw two vertical labelbars on the right size of a set of paneled plots. This is an older version of this script. See panel_34.ncl above for a function that makes it easier to panel two sets of contour plots, each with their own labelbar. 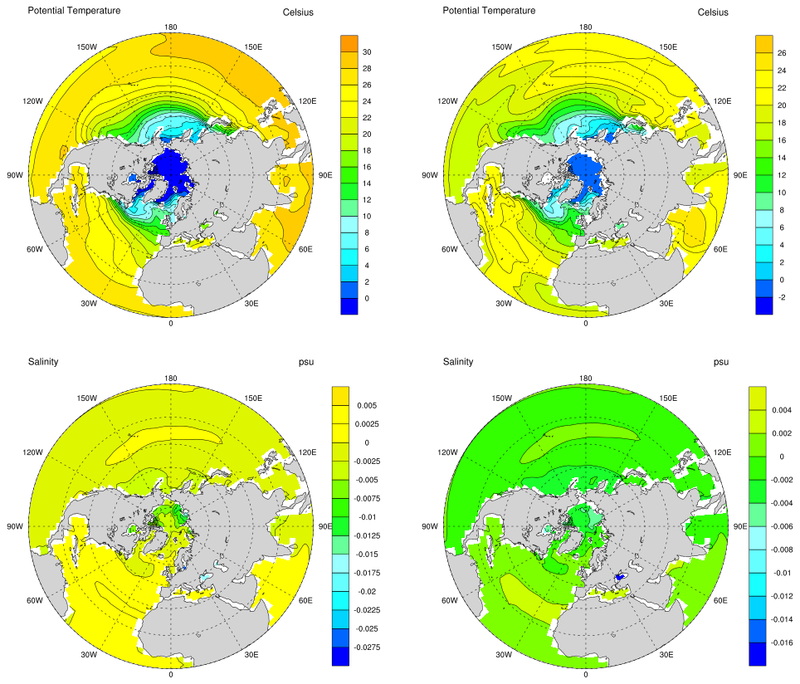 For this example, a getvalues block is used to retrieve plot information, like position, size, and colors, so the labelbar can be constructed from scratch. 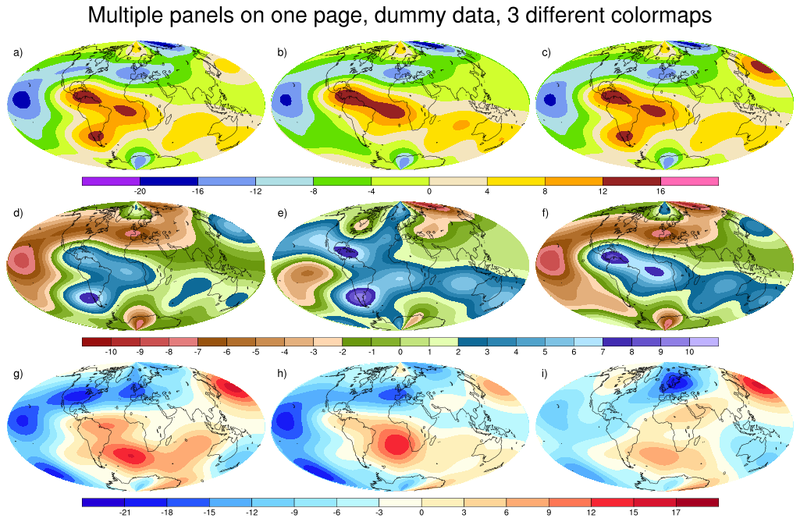 The plots were created using dummy data, and have shaded contours overlaid on filled contours overlaid on a map. 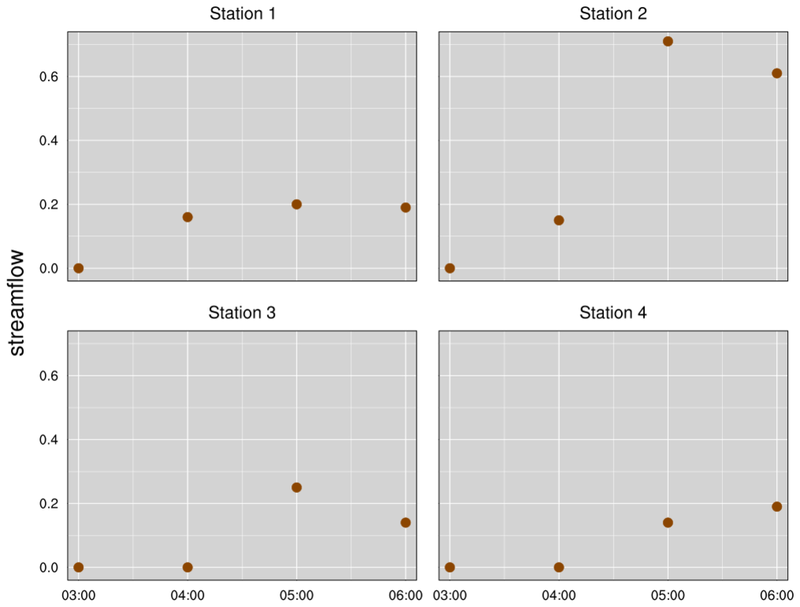 text_18.ncl: This example shows how to add two text strings to the top left and right of four plots and then panel them. You can't do this kind of thing using gsnPanelFigureStrings, because this only allows for one label per plot be added. The text strings are created with gsn_create_text, and then attached to each plot using gsn_add_annotation. You need to set the special resources amParallelPosF and amOrthogonalPosF to correctly align the text strings as desired. The gsn_attach_plots function is used to attach the plots, and then gsn_create_text and gsn_create_labelbar are used to create a main title and labelbar. The NhlGetBB function gets the bounding box of the given plot, which allows us to determine the locations for the title and labelbar. 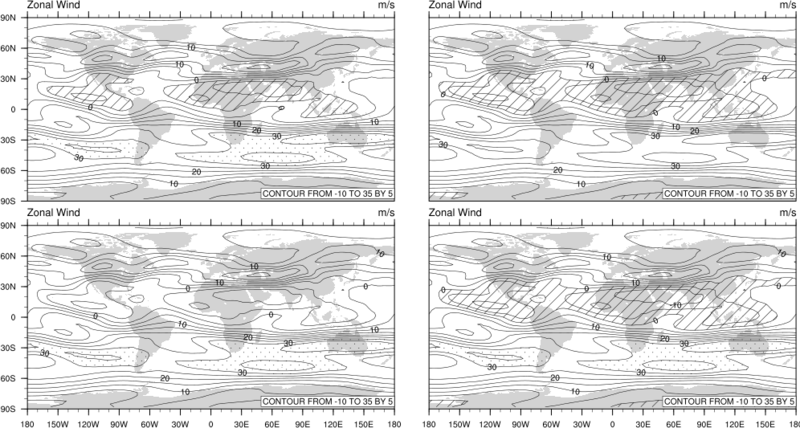 panel_36.ncl / panel_vp_36.ncl: This example shows two ways drawing four filled contour plots, with two plots having their own labelbar and the other two sharing a labelbar. The "panel_36.ncl" script uses gsn_panel to panel the four plots with the labelbars drawn for all of them, but it draws the last two labelbars in white and transparent, effectively hiding them. We then create a custom labelbar using to gsn_labelbar_ndc, and place it where the hidden labelbars are. This example is a bit kludgy, but you don't have to worry about sizing or positioning the individual plots. The "panel_vp_36.ncl" script uses viewport resources to position and resize each individual plot, and then creates a title and labelbar from scratch, using gsn_labelbar_ndc and gsn_text_ndc. This example requires a bit more work, but it is also more customizable, as you can use to place the plots, title, and labelbar wherever you want them. panel_37.ncl: This example shows how to draw a 4 x 3 set of paneled plots, each row being represented by a single labelbar. Basically, the leftmost two columns of plots have the labelbars turned off, and the rightmost column has the labelbars turned on. 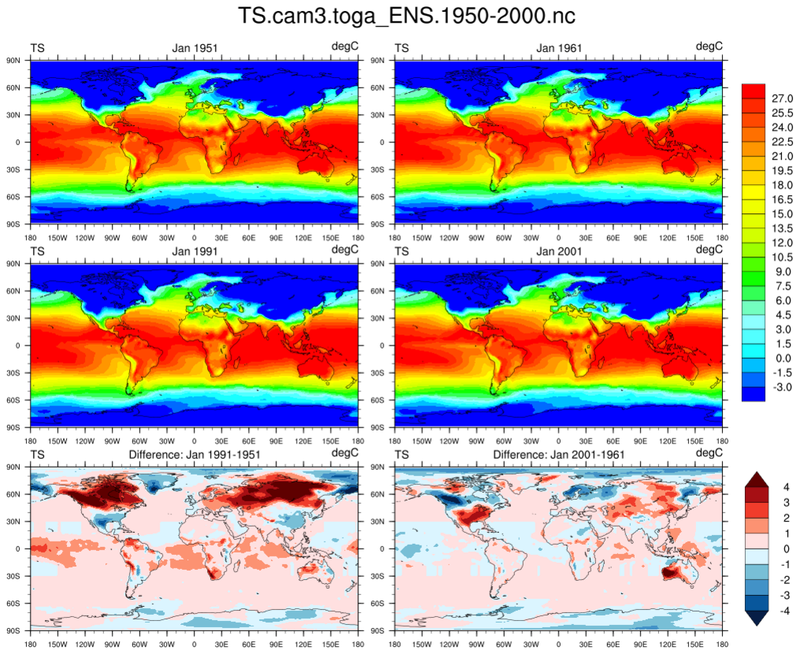 panel_38.ncl: This example shows how to draw three sets of paneled plots with various labelbars and titles, while keeping the plots the same size. In order to keep all the plots the same size, it's important that each row of plots is drawn to the exact same size of canvas. This is controlled with the gsnPanelTop and gsnPanelBottom resources. The gsnPanelYF resource is used to slightly adjust the Y position of the top of each row of plots, order to make room for various titles and labelbars. 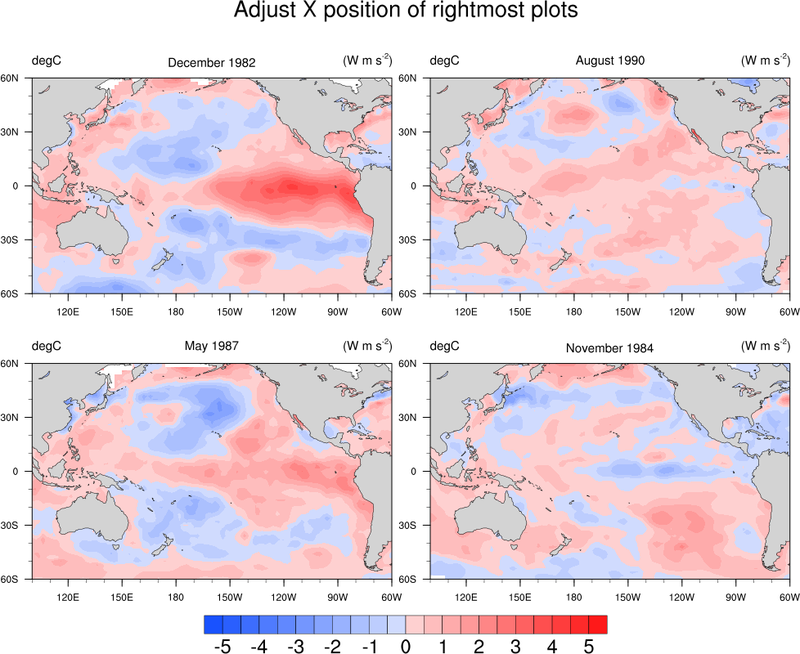 The txPosYF resource is used to position the title relative to the top of each row of plots. 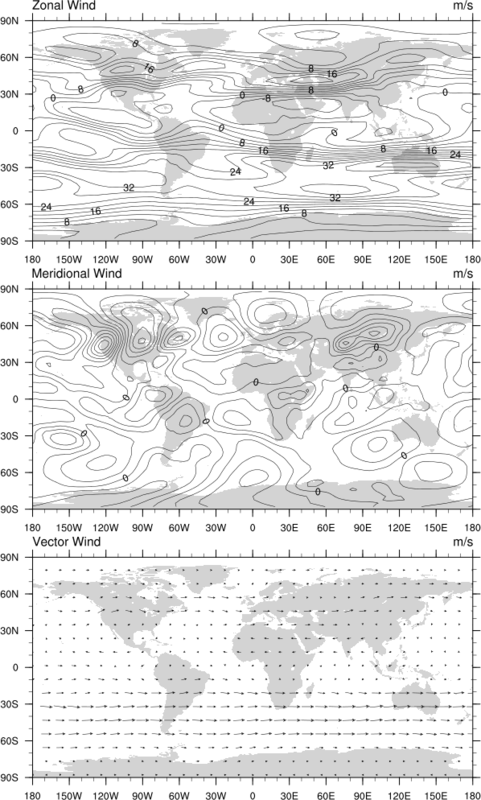 panel_39.ncl: This example shows how you can panel plots yourself using viewport resources vpXF, vpYF, vpWidthF, and vpHeightF. The left image was created using gsn_panel, and the right image was created using vp resources. They should be identical. One way to help determine good values to use for the vp resources is to first panel the plots using gsn_panel with gsnPanelDebug set to True. 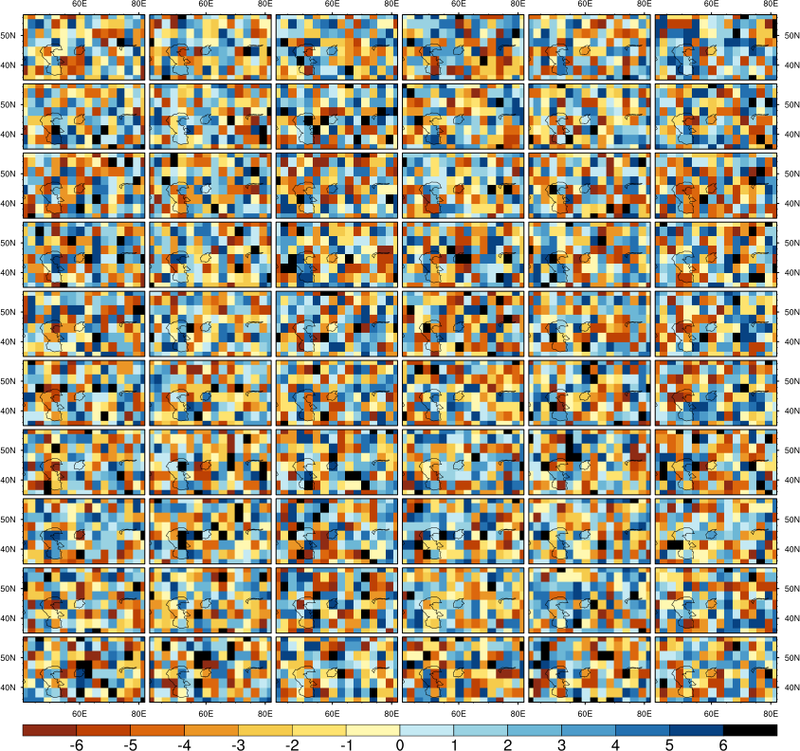 This echoes a bunch of output to the screen, including the "new" values being used for the X and Y position and the width and height of each plot. With this information, you can then recreate the paneled plots by setting the appropriate vp resources for each plot. 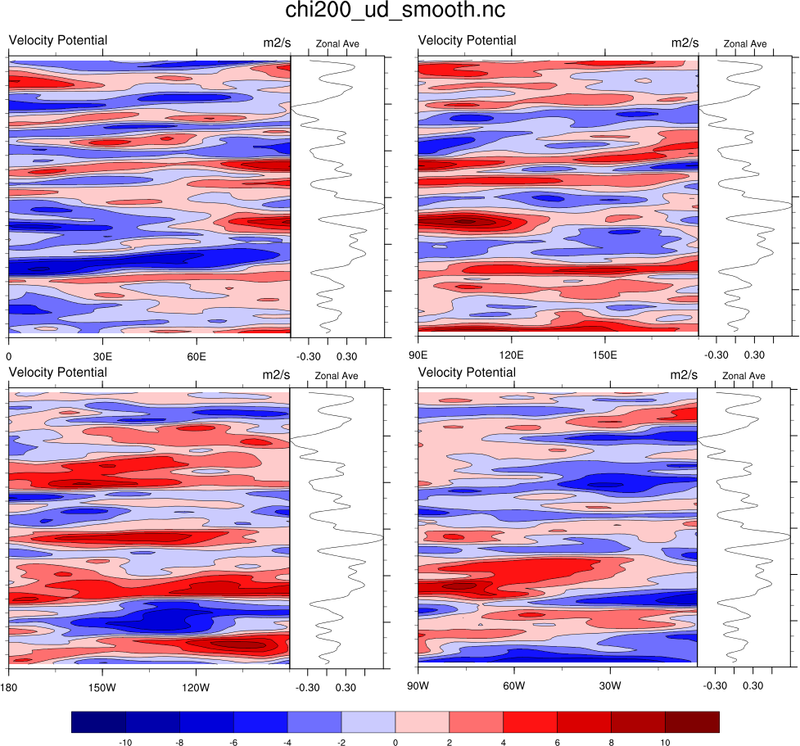 In this example all the plots are the same size, so you only need to set vpWidthF and vpHeightF once, then adjust the vpXF and vpYF resources as needed for each plot. panel_40.ncl: This example shows how to attach four plots along a Y axis, with a labelbar on the right side. gsn_attach_plots is used to attach the four plots, with the resource gsnAttachPlotsYAxis set to True. Each plot is customized to turn various tickmark labels and the labelbar on or off. 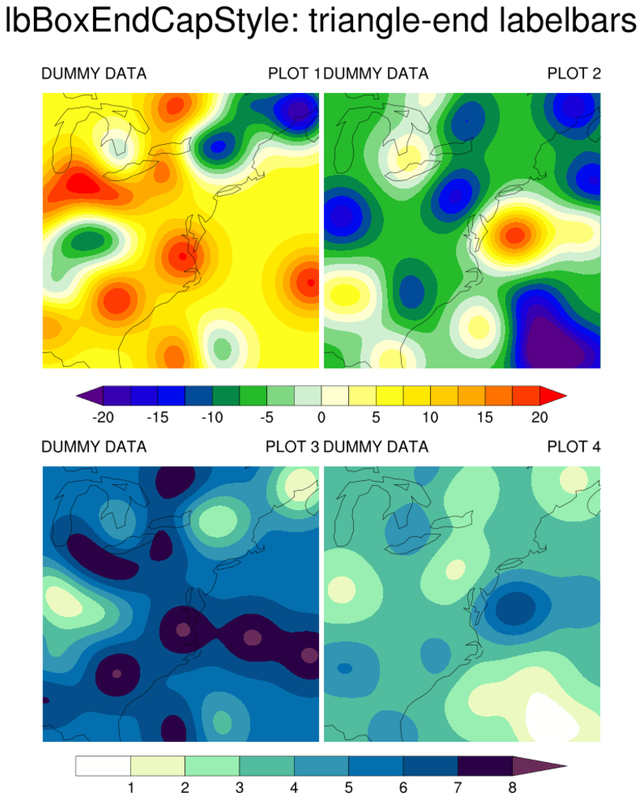 The second image simply shows a "trick" for using gsn_panel to add a main title to a set of plots that have already been attached. 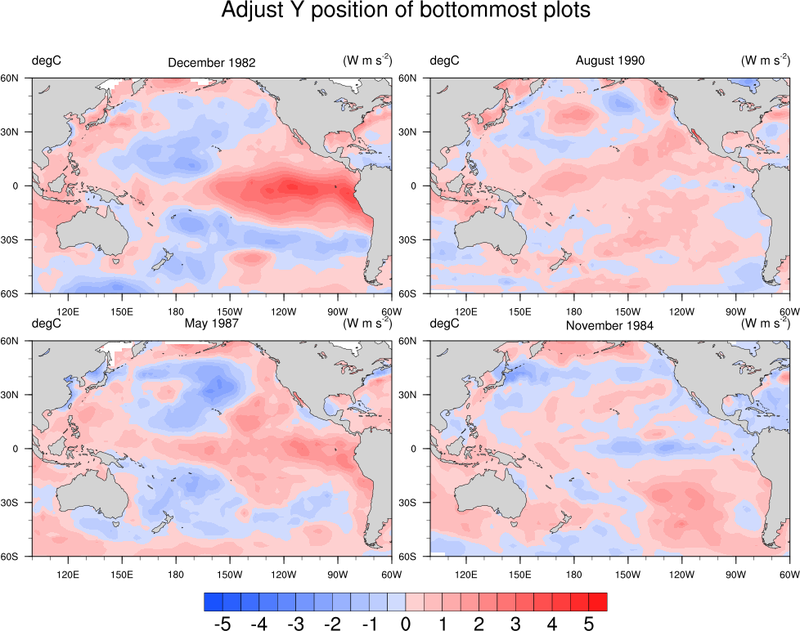 scatter_13.ncl: This example shows how to draw a panel plot with the plot area filled in gray, and with a title draw on the left of the panel using gsn_text_ndc and gsn_add_polygon. There's quite a bit of customization going on with the tickmark labels, in order to turn them on and off for various plots. panel_42.ncl: This example shows how gsnPanelXWhiteSpacePercent can be used to create space between panel columns. A common label bar is used for the panel figures. Between the panel columns, a different contour plot which uses a different color palette and adds grid lines is placed. Finally, creation of angled and colored text is added using gsn_text_ndc . 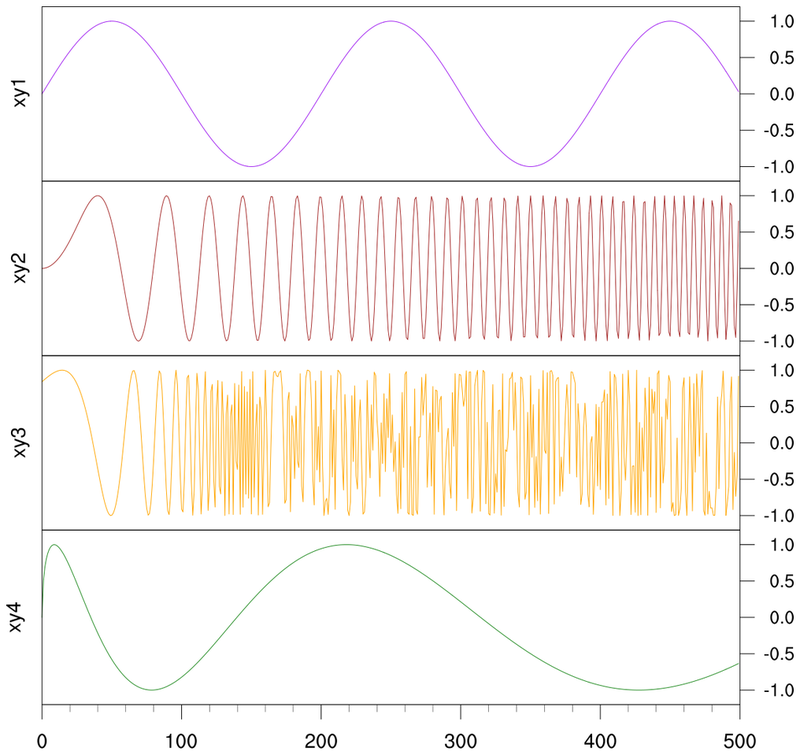 panel_43.ncl: Almost identical to panel_42, except that for demonstration purposes, the data used for the panel plots are scaled, via a local function ('scale_values'), to the same range as that used for the center regular contour plot. Hence, a single color bar. 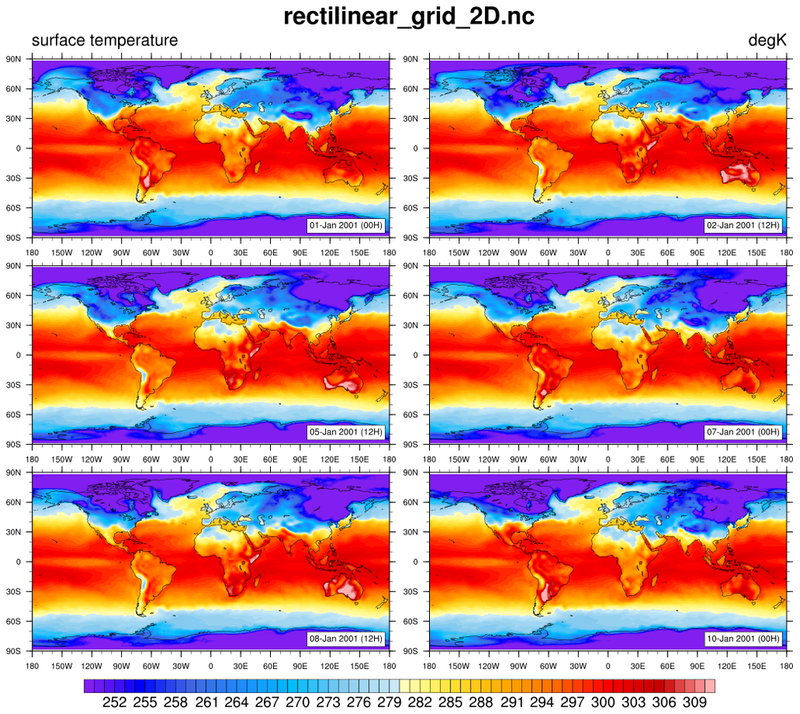 panel_GWLs_Rain.ncl: This example shows how to create a 4 x 4 panel of plots, where different columns of plots have their own labelbars. This is accomplished by turning off the individual labelbars for all but the bottom row plots. To further give the paneled plots a clean look, the tickmarks and their labels are turned off. The unadvertised gsnPanelSave resource is set to True, which tells gsn_panel to keep the plots in their resized state. This allows us to query for the NDC locations of the leftmost paneled plots, and then use this information to draw rotated titles on the left side using gsn_text_ndc. 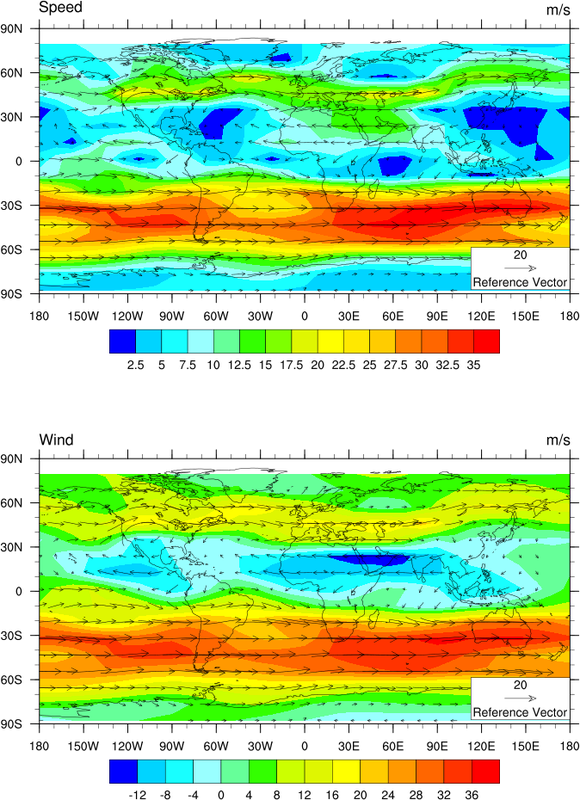 This script was written by Appolinaire Derbetini of the Laboratory for Environmental Modelling and Atmospheric Physics, University of Yaounde 1, Yaounde, Cameroon. 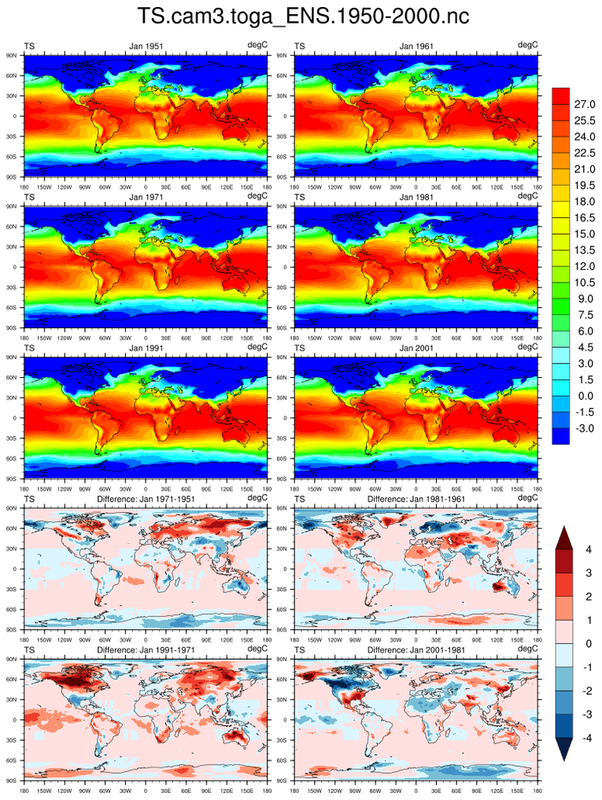 The idea was inspired by the paper of Pokam et al., 2018, Consequences of 1.5 C and 2 C global warming levels for temperature and precipitation changes over Central Africa, Environ. Res. Lett. 13 (2018) 055011, https://doi.org/10.1088/1748-9326/aab048.